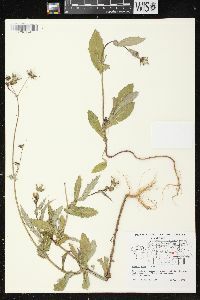 Annuals or biennials, 10-120(-200+) cm. Stem bases soft, herbaceous, hollow. 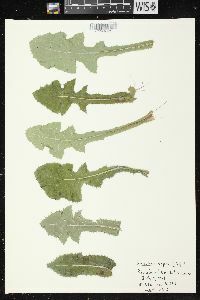 Leaves: blades of mid cauline spatulate or oblong to obovate or lanceolate, 6-30 × 1-15 cm, bases auriculate, auricles often recurved or curled, rounded, margins often pinnately lobed, lobes ± deltate (not constricted at bases), terminals usually larger than laterals, usually prickly-dentate. Peduncles usually stipitate-glandular, sometimes glabrous. Involucres 9-13+ mm. Phyllaries usually stipitate-glandular. Corollas: ligules mostly shorter than tubes. Cypselae stramineous to reddish brown, mostly ellipsoid, strongly compressed, ± winged, 2-3 mm, ribs 3(-5) on each face, faces smooth across and between ribs; pappi 6-9 mm. 2n = 18. Flowering (Mar-)Jul-Nov (year-round in south). 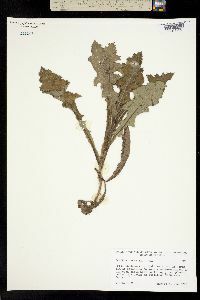 Disturbed sites, roadsides, along streams; 0-2500+ m; introduced; St. Pierre and Miquelon; Alta., B.C., Man., N.B., Nfld. and Labr., N.S., Ont., P.E.I., Que., Sask., Yukon; Ala., Alaska, Ariz., Ark., Calif., Colo., Conn., Del., D.C., Fla., Ga., Idaho, Ill., Ind., Iowa, Kans., Ky., La., Maine, Md., Mass., Mich., Minn., Miss., Mo., Mont., Nebr., Nev., N.H., N.J., N.Mex., N.Y., N.Dak., Ohio, Okla., Oreg., Pa., R.I., S.C., S.Dak., Tenn., Tex., Utah, Vt., Va., Wash., W.Va., Wis., Wyo. ; Europe, w Asia, n Africa; introduced also in Mexico, Central America, West Indies, Bermuda, South America, e Asia, s Africa, Pacific Islands (New Zealand), Australia. L. Boulos (1973) distinguished subsp. 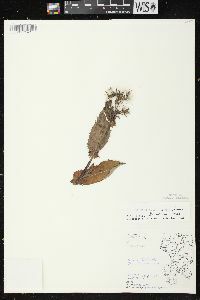 asper (annuals with leaves mostly cauline, cypselae margins little or not at all curved and/or ciliate, and one pair of chromosomes with small satellites) from subsp. 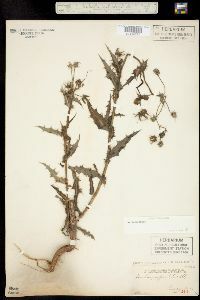 glaucescens (biennials with leaves mostly in rosettes, leaves mostly stiffer and more prickly than in subsp. 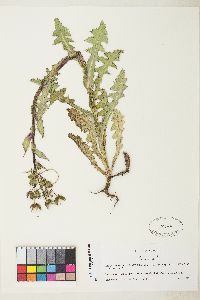 asper, cypselae with curved, ciliate margins, and two pairs of chromosomes with large satellites) and noted that the two subspecies are morphologically rather difficult to distinguish if the specimen in hand lacks the rootstock or stem base. 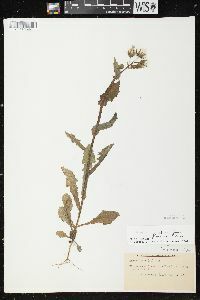 According to H. N. Barber (1941), crosses between Sonchus asper and S. oleraceus resulted in sterile hybrids. 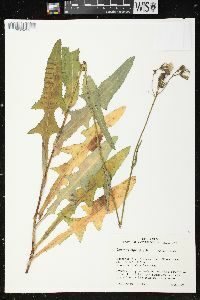 This is more common than the preceding species [Sonchus asper] and found in similar habitats. Much like no. 2 [Sonchus oleraceus L.] commonly more prickly; lvs pinnatifid, or frequently obovate and lobeless, with rounded and conspicuously prickly-toothed, not acute auricles; cor-tube somewhat longer than the ligule; achenes flatter, with 3(4-5) evident ribs on each face, not rugulose, although there may be minute projections from the marginal ribs; 2n=18. 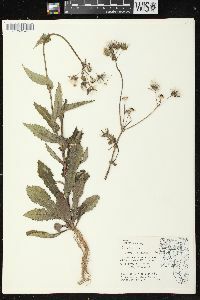 A cosmopolitan weed, native to Europe. July-Oct.